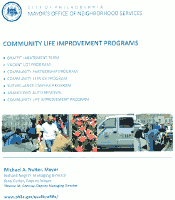 Philadelphia Community Life Improvement Program (CLIP) website and brochure. The CLIP program provides graffiti abatement, vacant lot cleaning, help with cleanups, community service opportunities, surveillance cameras, abandoned auto removal, and more. 263 Hermitage Update: Zoning Hearing Wednesday April 25 at 2:00 PM. Update! New plans for Saint Marys Approved. At a public meeting, Thursday January 11, 2018, attendees voted overwhelmingly to support the new plan for 21 houses, 35 apartments, parking for North Light and (some) parking for the community. On May 18, 2017, Councilman Jones withdrew bill 170009 to re-zone the Saint Mary's property for 100 apartments. But Now It's Time To Do It Again And Lets Make It 350! We have a lot of questions and we hope you do too! The complete St. Mary of the Assumption church property has been up for sale for some time and now there is now an agreement of sale (i.e. a developer has agreed to purchase the property). This is a large property (73,000 square feet) and stretches between Gay Street and Carson (with Conarroe in the middle). It includes the parking lot (100 spaces), church, school, rectory and convent. The developer, planning commission and our Councilman are all pressing for a high-density multi-family apartment development. This meeting is your chance to exchange information and get your opinions on the record. 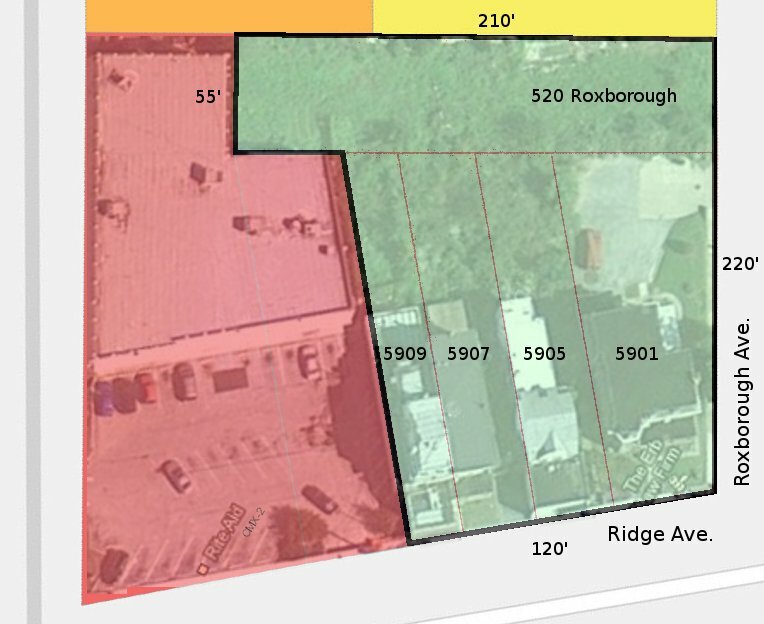 Get the latest info at our Saint Mary of the Assumption zoning page. 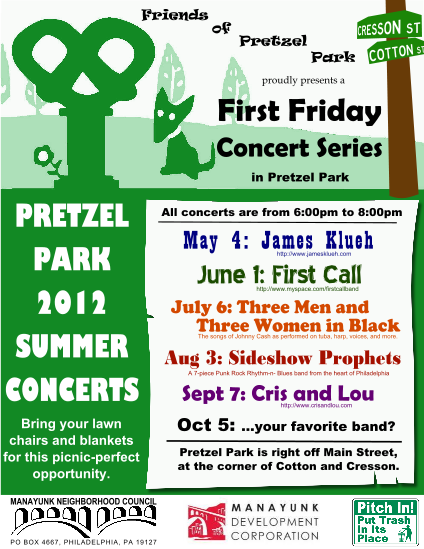 Events for Kids, Dogs, and Adults in Pretzel Park and on Venice Island! How this property will be redeveloped will have a huge impact on the neighborhood. The developer is still working on their design and is not yet ready to present a proposal. So now's the time to get our ideas in. There many possible scenarios, from 45 by-right houses to a combination of townhouses and apartments with 100-150 units or who knows what else. Will the buildings be kept and converted or torn down? Will there be parking for the neighbors? Will there be parking for North Light? Will the developer build by-right, or seek a variance, or will the Councilman sponsor a bill to City Council to rezone the parcel? This meeting is your chance to exchange information and get your opinions on the record, for the developer, and our public officials. Councilman Jones will be represented at the meeting. We are also hoping to have the Planning Commission and church represented. 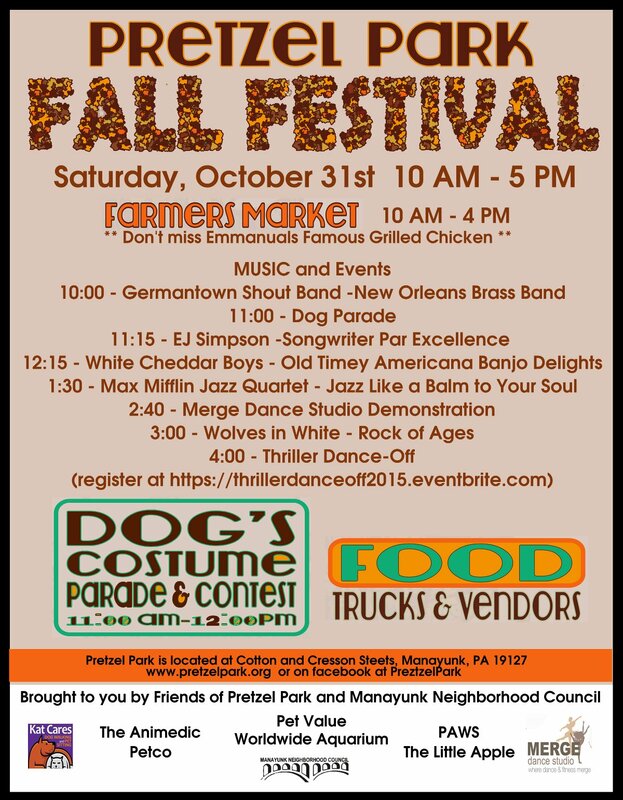 2015 Fall Festival Saturday October 31, from 10am to 5pm. More fun than you can shake a pumpkin at. 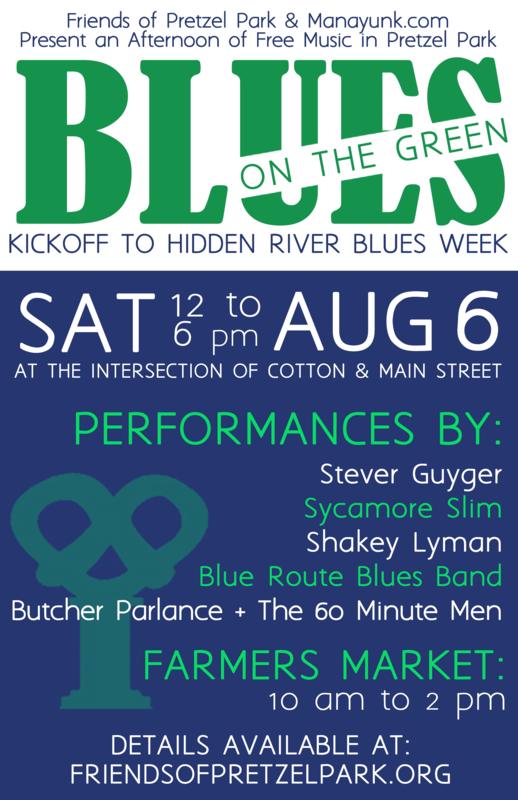 Face painting, vendors, music, the Farmers Market, and a great musical lineup, spells a whole day of fun and still time for the kiddies in the evening! There's nothing more fun dressing up your puppy and posting pictures on the internet, but, yes there is something more fun! 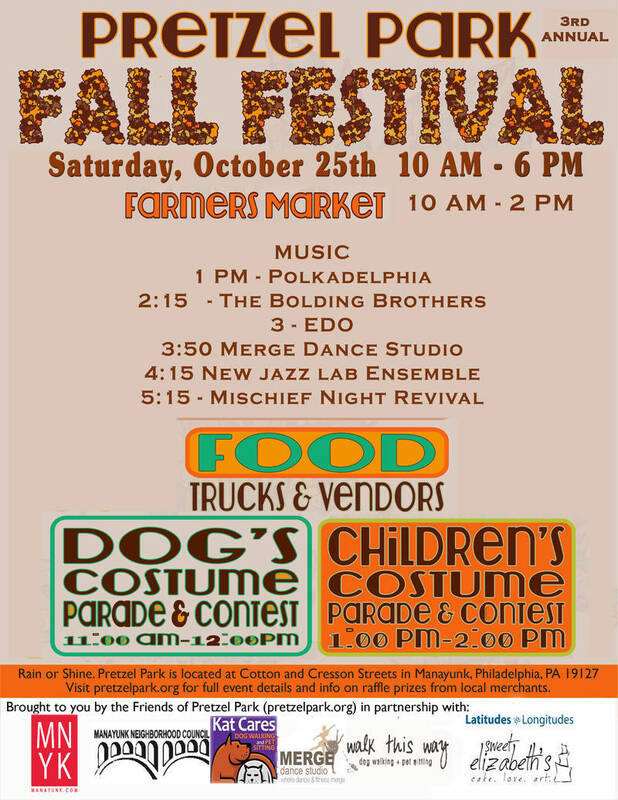 Dress up your puppy and join in the Pretzel Park Fall Festival Dog Parade, for fun and prizes. 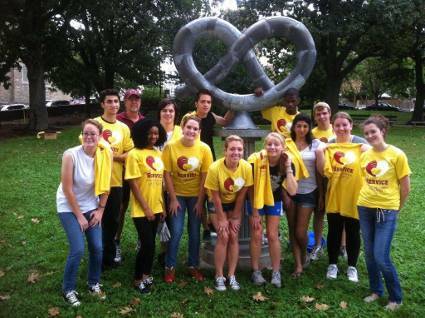 11 am in Pretzel Park. The Civic's request for a stay of demolition has been denied. The stay was requested to prevent the house from being demolished before the appeals of the demolition permit could be heard. The only thing standing in the way of demolition was any concern or second thoughts, by the Giovannones, about consequences should the civics win the appeals or consequenses of defying a community determined to maintain and preserve it's heritage and character. There were no second thoughts. Frank Giovannoni wasn't kidding when he said the building meant nothing to him and that there were buildings like it all up and down the Ridge. Frank was responding to a direct question by Judge Fox at the December 10 injunction hearing. 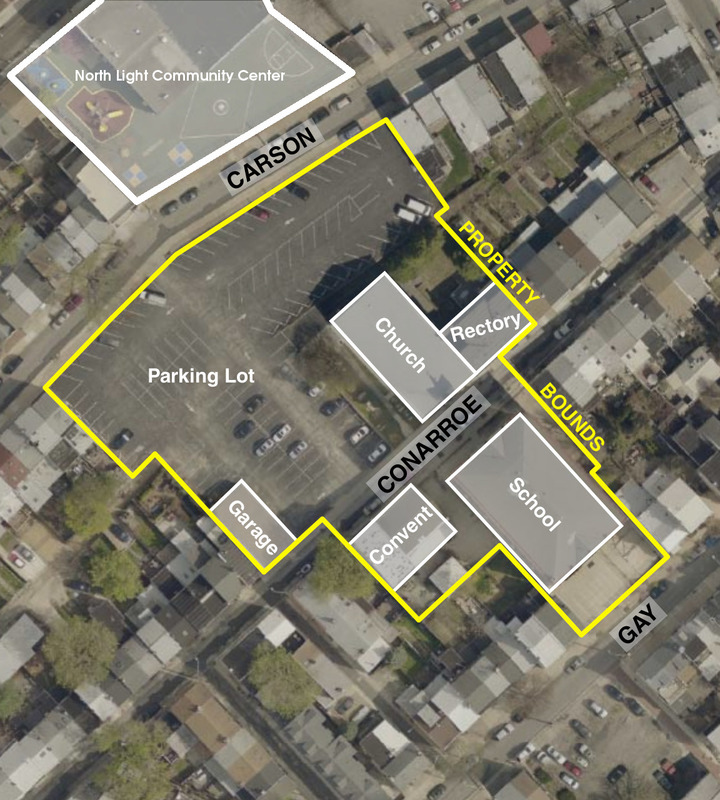 Central Roxborough Civic Association led a coalition of civics in an attempt to get a stay of the proposed demolition, pending appeal hearings to the Zoning Board and L&I Board of Review. There are, of course, not buildings, up and down the Ridge, comparable to the Bunting House. And maybe Frank was just expressing his frustration at the mess they have made. 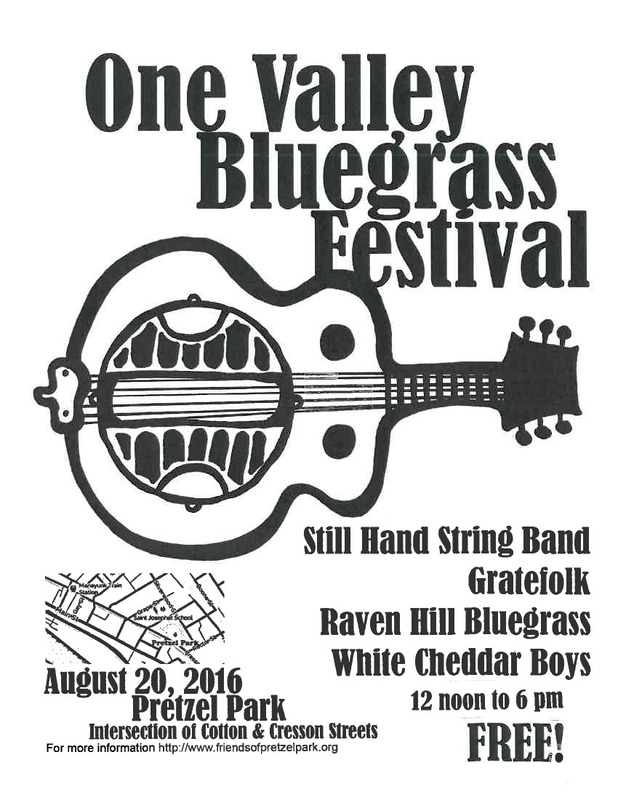 On the other hand, the strings are maybe really being pulled by the anonymous face(s) hiding behind 5901 Ridge LLC. So in the end it doesn't really matter what Frank thinks. On Thursday December 13 the judge entered her decision denying the stay pending the appeals. On Friday morning, a crew from Haines and Kibblehouse were out insuring nobody would be changing their minds. After knocking off for the weekend, the crew was back out to finish the knocking down on Monday. In two days, another piece of Roxborough heritage and 132 years of history were reduced to a pile of rubble. The only things saved were those that scavengers were able to cart away over the weekend. The Giovannonis, as best we know, are now planning to market the empty lot to fast food restaurants, banks and drug store chains. 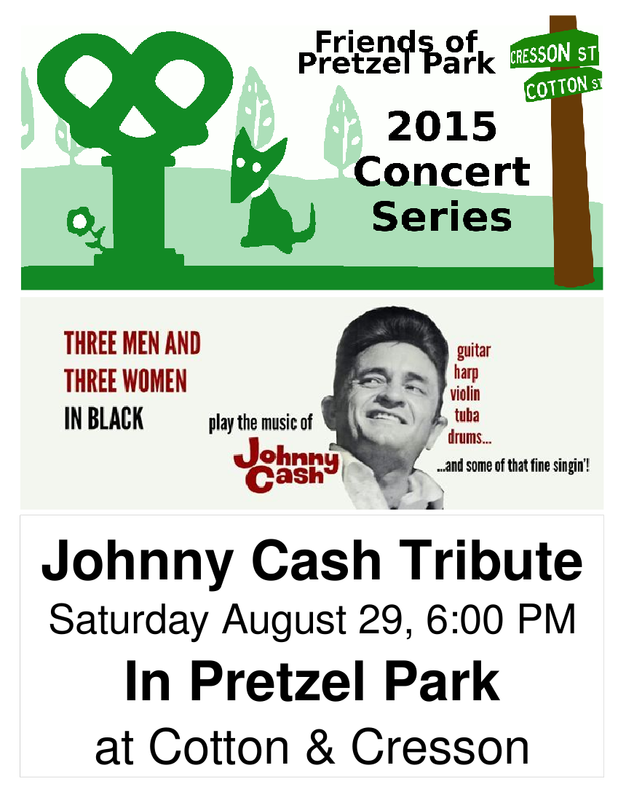 See the 5901 Ridge Ave memorial web site for the latest news. In September, 2012 Giovannone Construction pulled permits for the complete demolition of the beautiful Victorian building at the corner of Roxborough Ave and Ridge Ave, 5901 Ridge Ave.
As of 7 am Wed September 26, Central Roxborough Civic Association has filed appeals against the demolition permits and for a temporary restraining order agaist the demolition. It is reported in a Roxborough Patch Article that Giovannone claims the building is unsound and there only plans are an empty lot. Folks have put together an on-line petition where you can register your support for keeping the building. 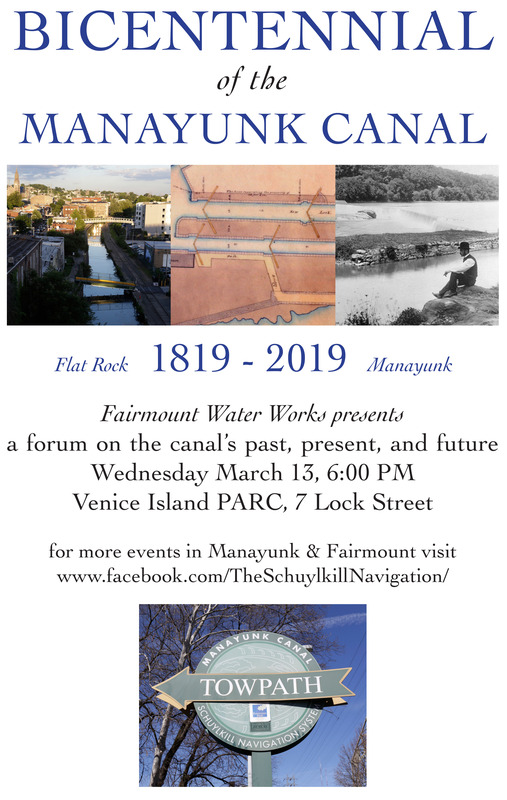 Manayunk Neighborhood Council is asking people to contact Councilman Jones and Giovannone Construction and let them know what you think. Phone: 1-215-487-1340 Giovannone Construction Inc.
To develop and maintain an informed and productive membership. To notify, inform, and involve residents in decisions that affect their neighborhood. 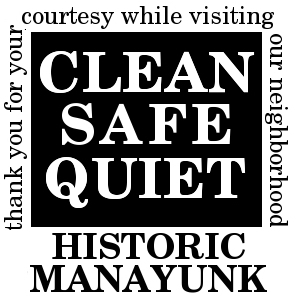 Manayunk Neighborhood Council is a not-for-profit civic association founded in the 1950's and incorporated in 1970. 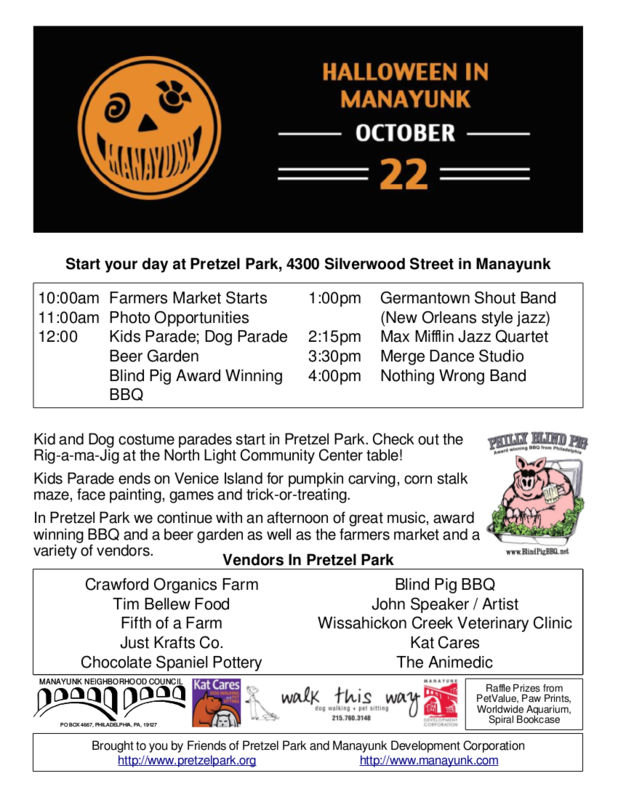 We are a community organization for the residents of Manayunk and Roxborough. 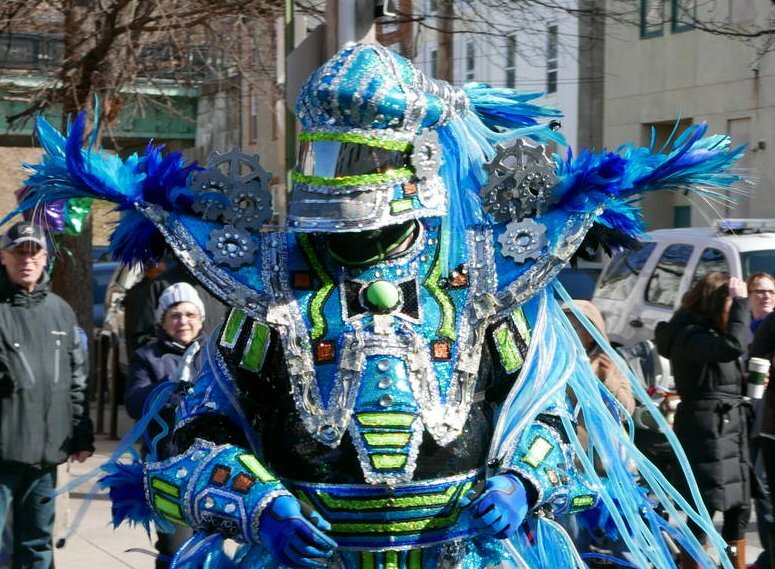 Residents are proud of their unique and historic neighborhood. Not long ago, our neighborhood was largely populated by owner occupied homes where children grew up and moved around the corner. 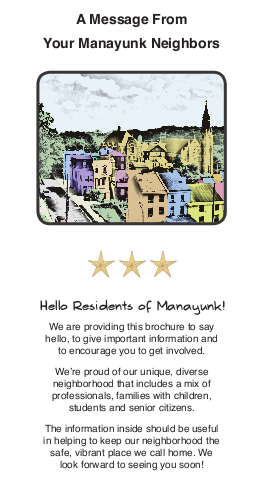 The Council is working to reestablish the friendly, cozy community that made Manayunk the popular place it is today for tourists, businesses, and developers. Our community is changing rapidly. These changes brought many improvements to the neighborhood but they have also caused problems for residents. MNC is working with other civic groups, city officials, planners and developers to promote ethical, responsible, and sustainable development.